Mormanity - a blog for those interested in The Church of Jesus Christ of Latter-day Saints: The Significance of Nahom: Just Three Letters? When thoughtfully understood, the evidence for Book of Mormon plausibility and authenticity related to Nephi’s account of crossing the Arabian Peninsula are profound and impressive. The modern findings and insights related to First Nephi 16 and 17, for example, are worthy of careful discussion and consideration. As a result of both field work by Latter-day Saints exploring potential Book of Mormon locations in the Arabian Peninsula and the work of non-LDS experts, we have a wealth of information that can strengthen our appreciation of the Book of Mormon and its plausibility. This includes such things as excellent candidates for the Valley Lemuel and the River Laman, the place called Shazer, the green area called Bountiful, specific plausible pathways corresponding to the detailed directions Nephi gives, and the place called Nahom where Ishmael was buried. These are some of the evidences which I touch upon in my Book of Mormon Evidences page. Confirming the plausibility of these places and names is interesting and can help us better understand the Book of Mormon, but don’t mistake these evidences for proof. These evidences do not prove that the Book of Mormon is true or that God exists or that Jesus is the Christ, but they do weigh heavily against claims that a 19th century yokel in the American frontier just fabricated the account in First Nephi 16 and 17. They weigh in favor of the hypothesis that those two chapters were written by someone who actually made the ancient journey described. The evidences are not trivial, contrived, random parallels. 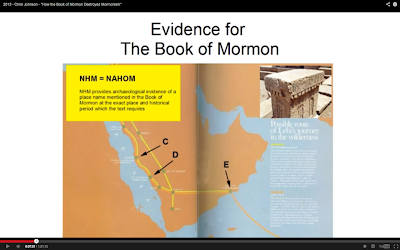 For example, what are we to say of finding an ancient burial place with a name essentially equivalent to Nahom in the Arabian Peninsula in exactly the place where the Book of Mormon implies it must be—at a place where one can depart from the south-southeast direction Nephi was originally traveling, substantially corresponding to the ancient incense trails of Arabia, and then turn nearly due east to reach a place like Bountiful, without passing through the nearby portions of the desolate empty quarter? Even if we don’t (yet) accept the Book of Mormon, shouldn’t that raise an eyebrow or two? And when 7th-century B.C. altars are found from that region bearing the tribal name Nihm, clearly based on the same Semitic root of NHM as Nahom, indicating that this tribal name and thus most likely a place name of that kind was in fact not just there “anciently” but in precisely the era that Ishmael was buried, shouldn’t that at least give us pause to appreciate that this is indeed an interesting find for Book of Mormon fans? When critics of the Church chant the mantra that “there is no evidence for the Book of Mormon,” informed Latter-day Saints may occasionally dare to make an objections and point out that there is a growing body of rather impressive evidences that should at least be considered before hastily rejecting Book of Mormon claims. When committed anti-Mormon critics are presented with such evidence, the response can be surprising. Take for example an enthusiastically received presentation at a recent ex-Mormon conference on Oct. 19th in Salt Lake City, where Chris Johnson presumed to use statistics to explain away the Book of Mormon. His statistical sleight-of-hand allegedly exposing the Book of Mormon was supposed to be so impressive that it could utterly destroy the very foundation of Mormonism, thus the title, “How the Book of Mormon Destroyed Mormonism.” His work attempting to link the Book of Mormon to an obscure book about the war of 1812 has been discussed here previously and at Mormanity, drawing upon a rigorous debunking by Ben McGuire at the Mormon Interpreter. Here I would like to address Chris Johnson’s other comments on parallels. If you must, you can watch the video by using the URL provided in footnote #2 of McGuire’sarticle, or you can use this shortcut: http://tinyurl.com/late-war-fail. But I don’t recommend it because of its mocking and insulting tone, beginning with mockery of Jeffrey Holland in his defense of the Book of Mormon, and ending with snippets of video clips from the Heaven’s Gate suicide cult to equate Mormonism with them. Low and rather inappropriate, IMHO. In spite of my disappointment in his stance and in spite of the errors I think he has made in his approach, I still find Chris Johnson interesting with intelligence and humor that I wish were being applied to better causes. His approach to the issue of the Arabian Peninsula is instructive. I find it interesting that for one fascinated in exploring parallels related to the Book of Mormon, he swiftly dismisses the evidence from the Arabian Peninsula as just trivial and meaningless parallels. All the impressive finds and bull’s eyes, in this well trained anti-Mormon’s view, boil down to nothing more than a random parallel of 3 letters that can be explained away with the tiniest exertion of a brain cell or two. Perhaps the book is true, or false, depending on the evidence. 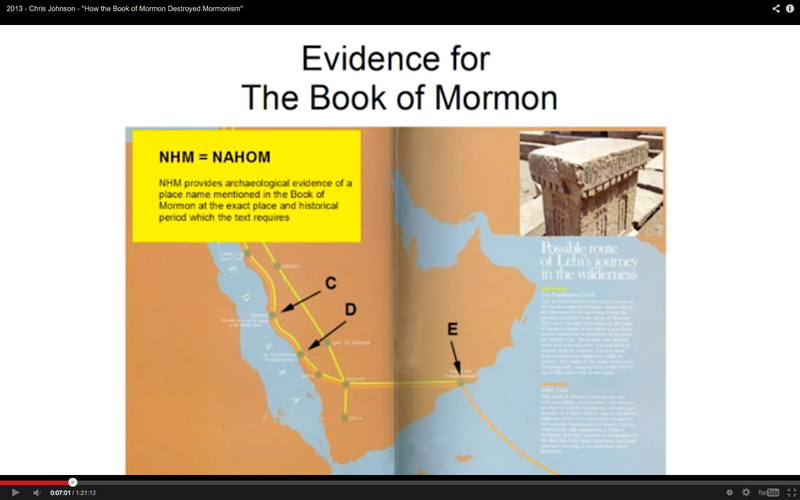 Here’s some of the evidence for the Book of Mormon. Just really briefly, they found Nahom. It’s 3 letters. NHM because they removed the O and the A because Hebrew apparently didn’t have those letter back then. But basically, um, so we have 3 letters. And, there’s a few other little things like that. But what is the significance of the evidence for the Joseph Smith as a prophet/translator? What is the evidence? So NHM, for me, that’s probably the biggest evidence. NHM. It’s in the right place, it’s the right name. 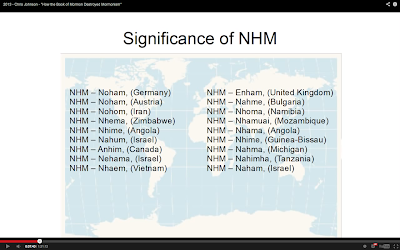 We have NHM in Germany, Austria,, Iran, Zimbabwe, Angola, Israel, Canada, and basically everywhere you look you can find those 3 letters. I’m sure there’s a dozen companies named NHM that all around the world as well. Basically, if it was QXP, that would be more significant because those are more rare across the languages of the world. But NHM happened to be some of the most common letters. So the significance of NHM is lacking. And there you have it. All the impressive finds in the Arabian Peninsula reduced to 3 letters, and they are readily explained away because lots of other countries have places with NHM in it. Here are 3 more letters that come to mind: HUH? This argument is given by the man presumably delivering a death blow to the Book of Mormon with brilliant analysis and scholarship, finding telltale smoking-gun parallels in random four-word chunks of text shared by the Book of Mormon and The Late War Against the United States, chunks that are also shared with numerous other texts before and after the Book of Mormon, not because they were somehow plagiarized, but because of common language and methods of expression. Minor random and irrelevant parallels are enough to destroy Mormonism, but the evidence of intricate, relevant, and interesting “parallels” like confirming the existence of an ancient burial place Nahom/Nehem/NHM in exactly the right place and time given in the Book of Mormon--complete with supporting archaeological finds--is irrelevant and “lacking in significance” because…because other 3-letter combinations with NHM can be found in, say, Mozambique? The first point to be made is that the name NHM (in any of its variant spellings Nehem/Nihm/Nahm, and so on) is not found anywhere else in Arabia as a place name. It is unique. It is known to appear only once in southern Arabian writings (as a personal name) and a handful of times in northern Arabian Safaitic texts. There are also some interesting appearances in the Old Testament; as Naham [a person] (1 Chronicles 4:19), as Nehum [another person](Nehemiah 7:7), and, of course, as the name of the Prophet Nahom, whose brief book provides some of the Bible’s most vivid poetic imagery. … These biblical occurrences of the name, however, are far removed geographically from southern Arabia, and no historical connection with the tribal name in Yemen can be made. The fact that the name appears only once as an Arabian place name argues strongly in itself for a possible link with Nephi’s Nahom. Of related interest is Wikipedia’s page of Arabic place names. I couldn’t see anything related to Nahom or related forms. Look for yourself. I was intrigued by the listing of Nahum as a place name in Israel. Could Joseph Smith have gotten the concept of Nahum as an Old World place name from that? Not likely. Wikipedia’s article on Sde Nahum, Israel explains that it is a modern kibbutz founded in 1937. Population around 550. Not likely an influence for the Book of Mormon. What about Nehama, Israel? Wikipedia doesn’t seem aware of it, so it must not exist, I suppose. But there is an Israeli “Comfort Girls” band called Habanot Nechama. Is that the link? Or what about Nahma, Michigan? Another 500-person township. Founded 1881. Probably not an inspiration for Nahom. Or Anhim, Canada? Again, HUH? Sorry, but neither I not Wikipedia can find this place. Might exist, but if I can’t find it with Google and Wikipedia, what chance would Joseph Smith have? Any of you able to help me out here? I'm curious about just how common and obvious NHM is. Again, please, could someone explain to me how these scattered and sometimes nonexistent places make NHM names so extremely common, and how any of these could have somehow influence Joseph Smith to put Nahom as a place in the Book of Mormon, much less as a place name that perfectly fits a genuine ancient burial place in just the right spot? And it came to pass that Ishmael died, and was buried in the place which was called Nahom. And it came to pass that the daughters of Ishmael did mourn exceedingly, because of the loss of their father, and because of their afflictions in the wilderness; and they did murmur against my father, because he had brought them out of the land of Jerusalem, saying: Our father is dead; yea, and we have wandered much in the wilderness, and we have suffered much affliction, hunger, thirst, and fatigue; and after all these sufferings we must perish in the wilderness with hunger. And thus they did murmur against my father, and also against me; and they were desirous to return again to Jerusalem. The apparent deft play one words by Nephi in the text is just one aspect of the many subtle evidences related to the issue of Nahom and the Arabian Peninsula aspects of the Book of Mormon. To ignore that body of evidence and see the evidence as no more than 3 common letters that can be accounted for by, say, Nahimha in Tanzania, reflects a fundamental misunderstanding of the very nature of relevant evidence. Further, the straining at four-word gnats in the Book of Mormon to “destroy” Mormonism does not reflect any significant improvement in objectivity or analysis. The point here is that when our most vocal or committed opponents speak out, they are often not interested in a genuine debate or fair consideration of the actual evidence, but in trashing the faith at all costs. Do not dismayed to hear that the evidence in favor of the Book of Mormon, no matter how impressive, will always be “lacking significance” in their minds, while that which is truly trivial will be given great weight if it can be used to attack. Do be dismayed, however, at how the Book of Mormon is becoming more interesting and more worth thoughtful and even scholarly reflection today than it ever was. There are numerous issues that we can better appreciate and objections we can better answer today, and more reason than even to pick it up and take it seriously. It’s a remarkable book worthy of far more than flippant dismissal and bad statistics. Another argument Johnson makes is that Joseph simply plagiarized a dream from his father to give us Lehi's dream. The problem in citing that dream as evidence of plagiarism is that the content of his father's dream was written down years after the Book of Mormon was published. See FairMormon's page on this topic. In sharing her recollection of that dream, Joseph's mother may have been heavily influenced by the content of Lehi's vision in the Book of Mormon. No one at that time saw any problem in Book of Mormon authorship because of the similarity of the two visions. INteresting issue, though, and people can look at it in other ways, of course. Is there any way to really quantify the odds of Joseph Smith making such a bullseye with the knowledge of the Arabaian Desert available at the time? I understand that there are maps of the region that Joseph could possibly have seen with the name Nehem. Sort of on the same subject, has anyone made a list of the documents and books that have been suggested as providing Joesph with the names and information that form the basis of so many of Joeph's direct hits? Just how big was that Palmyra library anyhow??? Jeff, the subject of plagiarism was the first hurdle I encountered when reading the Book of Mormon for the first time. As the missionaries suggested, I read Moroni's promise, and then started at 3 Nephi chapter 11. The first thing I noticed were that much of the Lord's words in 3 Nephi were identicel to the New Testament. But then I realized that there was no reason why the Lord could not deliver identical words to two groups. A little later on in 3 Nephi, I realize that in some places the wording was not 100% identcal. And then I realized also that there is no reason that requires the Lord to deliver 100% identical words to two different groups. If two passages are the same, my response is "So what? Why not? Isn't the Lord 'allowed' to do that if He sees fit for some reason?" And again, if two passages are slightly different, "So what? Why not? Isn't the Lord 'allowed' to do that if He sees fit for some reason?" If JS Sr and Lehi had the same inspired dream, so what? Isn't the Lord allowed to give the same dream to more than one person? He certainly can give the same dream to more than one person. One man I taught in brazil had the dream, though he had not read that portion of the book. But of course, such things are foolish, right? Surely this man in the middle of the Amazon had a reason to make up that he had a dream. Yet another of the many evidences God has been willing to give me either personally or through others. what are we to say of finding an ancient burial place with a name essentially equivalent to Nahom in the Arabian Peninsula in exactly the place where the Book of Mormon implies it must be? You just answered your own question. The location is an IMPLICATION. Church leaders from Joseph Smith to now still have no official geography. I am pretty sure that there is a geography for the Arabian peninsula. I understand that Book of Mormon Geography is not certain. But Nephi tells us in which direction his family traveled after leaving Jerusalem. Those directions match up with the area of Nahom in reality. I am pretty sure that is Jeff's whole point in posting this: that old world evidence and geography match up with what is presented in the Book of Mormon. Fair enough, more to your point. "old world evidence and geography match up with what is presented in the Book of Mormon" is hardly noteworthy considering that the argument can be made J.Smith derived the Semitic names used in the BOM exactly or very similar from Semitic names in the King James Bible. The fact Smith used Nahom along with so many variations of Semitic sounding names is not so remarkable. I believe personal bias will spin this one way or the other, but given the immense Semitic location of the Arabian peninsula, It's more incredible that a Semitic root such as NHM (which still could be pronounced NiHM, NeHeM, NaHaM or NaHM) would NOT be found there. And BTW, Jeff, not everyone who comes to a differing conclusion is "anti-Mormon". That is a common LDS tactic used to disparage someone's character and label them as an intentional liar, or somehow evil. Yes, I think personal bias allows one to view this as they will. This is why Jeff, and everyone else, offers this not as definitive proof of the Book of Mormon but as compelling evidence. Fascinating. If I understand correcting, the whole point behind the 3 letters, is supposedly critics previously claimed that that trees etc never existed on the eastern arabian peninsula. With the three letter bit, apologist essentially concede that the BoM version is indeed unusual, but not impossible. The fascinating part is how types like Mormanity semantically adjust not impossible to plausible and then types like Glenn come along and turn plausible into Bullseye. Three letters, WOW ...... not impossible turned into bullseye. Physicist claim it is possible for every molecule of our body's to dematerialize, tunnel through a wall and reassemble on the other side. BULLSEYE, once again the BoM knew this and has proven how hate filled and evil those anti-Mormons are. Unfortunately you understand incorrectly. The significance of NHM has nothing to do with trees and everything to do with Joseph Smith knowing that there was a place called NHM (Nahom) in the southwest corner of the arabian peninsula. Not only did he know there was such a place, but he knew that it was an ancient burial ground. And not only that, he knew that it dated to ~600 BC. Trees don't come into the picture until you turn due east from NHM, at which point you do run into trees, a feature that is not prominent through most of Arabia. But that is only secondary. The important thing is he knew exactly what, when, and where NHM were. Pretty good for a farm boy. I had a three-month conversation with Chris Johnson about the correlations between the Book of Moses and the Book of Giants from the Dead Sea Scrolls, including the proper name Mahujah. It took a very similar track. Johnson insisted that all the parallels from the Book of Giants could also be found in Richard Laurence's Book of Enoch, but only managed to produce 75% of them and force the rest. He never actually established that Joseph had access to the Book of Enoch. To explain the Mahijah parallel, he started hunting for all proper names that included MH, and then said Joseph probably derived it from Methuselah. Weak, weak, weak. But there is no reasoning with these people. My bad. Fascinating. JS knew that in 600 BC people buried their dead. WOW. That is kinda of like translating robber verse thieve whichever is correct. A statistically phenomenal 50% chance that can not be describe as possible or plausible, but only bullseye. Of course bullseye would mean such altars were unheard of to pre-1970s archeologist and unique to only the nephite founding fathers and not at all typical of the region. If I am not understanding wrong, the canonized version indicates that JS knew nothing and when he did know reformed egyptian it was for a brief ephemeral moment. Of course, the entire journey is considered a miraculous event, making things like modern day trees not even secondary, but irrelevant, unless things like liahonas and ship building instruction were not extraterrestrial influences, but rather natural events. Your criticism doesn't even make sense. I can only assume that you are purposefully missing the point. Care to explain what it is that does not make sense? Or are you deliberatly missing some point? You are trying to dismiss the argument & evidence by saying "Fascinating. JS knew that in 600 BC people buried their dead. WOW. That is kinda of like translating robber verse thieve whichever is correct. A statistically phenomenal 50% chance that can not be describe as possible or plausible, but only bullseye." You know very well the fact that Lehi and party buried their dead is beside the point. You are just being sarcastic and dismissive. You just admitted that you understood the gist of the orginal response and ergo made sense, contradicting yourself. Your emotional out burst was then due to an inability to formulate a rational response. I however have no problem analysing each of the pro/con points being made. They are as follows. Mormanty and company self declare satistical significance to three letters and eastern location with trees. Some guy named Chris Johnson disagrees with the satistical signifigance. All parties agree to the existence of the three letter discription and there exists trees on the eastern seaboard. Pretty simple. As an aside it was Mormanity that taught me about the camora/moroni connection. To use your description forwardjoe, Mormanity treated it sarcastically and dismissively. While it was interesting, I found it to befar from a bullseye, whatever, the way Mormanity claim a website describe it. I requested the website from Mormanity so I could let the author know that I agreed w Mormanity that it was not a bullseye. Mormanity refused to provide the website, I assume because Mormanity knew full well he was making a strawman aguement. Few months ago I did find further info and learned there was even more to the position that Mormanity was not telling, such as contemporaies of JS describng his affinty for capt kidd stories and Mormon debate agnostic sources of the place time period indicating how common capt kidd stories were. Point is the camora bit fairs better with the reasonable person test and it is one the critics weakest points. I am glad to see you admit that people burying the dead is irrevelant, from the posts that was not clear, but as you point out are beside the point. The only revelant part is at the location in question there exists a stone with three letters that roughly correspond to to the english letters nhm. I find it interesting that you believe it ok for Mormanity to say three letters HUH, but when i do the same and say three letters WOW it is somehow bad. It appears I have knack for getting apologist to see their own reflection, and when they do, hate. Self hate is an interesting path to happiness. I guess I shouldn't have expected an actual response. I am rubber your glue what ever you say bounces off me and sticks to you. I agree, I am little slow at recognizing the audience. Once again you miss the point- it's not that Joseph knew that people buried their dead, it's that he somehow knew the location of an ancient burial ground he had never been to. He also knew its name and the ancient date to which it corresponded. But I think you already knew that. Once again you miss the point. As you correctly point out, the are several places all long the eastern arabian seaboard and pretty much any where in the southern arabia is viable candidate. So all you have is a stone in a graveyard in southern arabia, not with a name, but three letters that roughly correspond to the English NHM. But I think you already knew that, didn't you Bakedizzle? One would expect many such random dots could be drawn with any work of fiction. mormanity's own statements on statisical signifigance (let alone Chris Johnsn's) from caroma/moroni and leaves of grass indicate so. Therefore, if I was a critic the fact that this is self declare strong point of the apologist is one the stronget items against them. But you already knew that didn't you, Bakedizzle? What we have is more than a stone in a graveyard. It is at least 3 altars bearing this inscription, and it is clearly a name, not merely 3 letters. 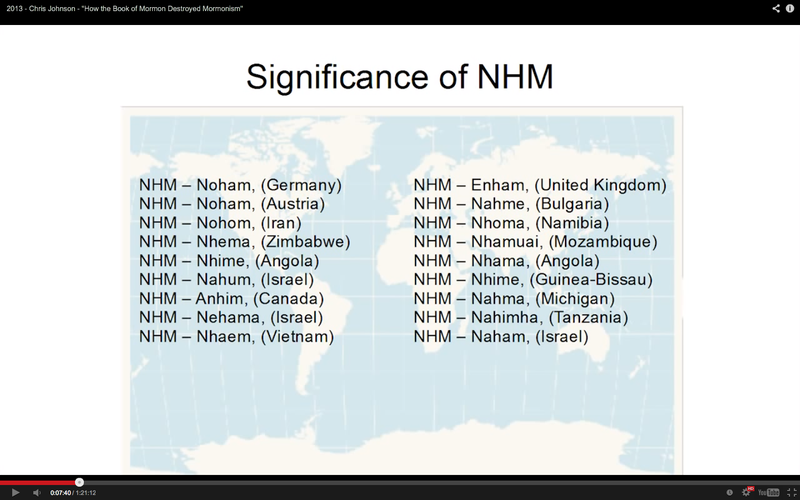 They don't "roughly" correspond to NHM, they truly correspond- that is their translation. And once again, this three-letter combination crops up in the right location at a place that served the appropriate purpose in a time-frame that makes sense. It also corresponds nicely to the place where the frankincense trail turns east, as did Lehi's trail. It is not just the occurrence of NHM, a burial ground, a correct date, or a correct place on the trail individually that makes this start to look like a bullseye, but the combination of these things together. Of course they don't prove the Book of Mormon is true. It could be coincidence. But it is certainly food for thought. I appreciaye the comments. Very refreshng compared to forwardjoe. given how I started the discission "WOW ...... not impossible turned into bullseye". It sounds like you and I essentially agree with difderent words, you moderate to "start to look like" and "could be coincidence". My retort to Mormanit y is if this NHM thng is to raise an eye brow, then the camora/moroni thing must also raise an eye brow to be consistent. I apologize if my comments are not very refreshing. I didn't feel the need to lay out all of the points of evidence when I knew you already understood them. Are you referencing the Comoros Island and city of Moroni? If so, that is not on par with NHM. NHM is a real world place that is in many ways consistent with the BoM narrative and is able to make a plausible case for cultural and historical connections; things that Joseph Smith could not possibly have known. Comoros/Moroni is just a triviality. No proof exists that Joseph even knew about these places nor that they were mentioned on maps. There is no meaningful connection in the names to the Book of Mormon terms except for how they are pronounced. If you are talking about something else, let me know. Let me double check ... Nope. The camora islands are indeed a real world place .... Like you say no point in laying out what already know regarding capt kidd stories etc or other items you can simple find for yourself. Unlike you, I do not miss your point. You find the connection to be silly or pathetic. That is fine, my point is that this makes you inconsistent, which is cool. According to my pluralist faith some people will only find happiness via an inconsistent world view. Of course the islands are a real place. My point is that NHM actually has something to do with the Book of Mormon narrative. It can inform our understanding of the book. Unlike the Comoros islands which don't seem to be included on maps of Joseph's time and don't have anything to say about the Book of Mormon beyond commonality in spelling or in how they are pronounced. "inform our understanding of the book" ? How does it inform your understanding of the book? It is the opposite that is happening. It is your understanding of the book that is being applied to NHM, not the other way around. The inscriptions roughly correspond to NHM and NHM is not interpreted to be Nahom, unless understanding of the book suggest to vowel morphing, dating, etc. "Statistical insignificance and plagiarism are 2 very distinct and separate concepts. What does demonstrating insignificance have to do with plagiarism? They are so orthogonal they are almost mutually exclusive. To suggest a supposed connection is so random that the connection is only imagined is to suggest no plagiarism. Then again plagiarism retorts are one of Mormanity's favorite strawmen." It informs the understanding of the book because you can point to a real world place, in the appropriate time and see what Nephi was talking about. Obviously if you don't believe the Book of Mormon it wouldn't help you at all. Regarding your last paragraph, I don't know the context of what you are talking about. Sounds like concessions to me. It must now be a matter of established fact that Mormanity's plagiarism retorts are blatant lies. Yes, of course, blatant lies..
"It's just...you know, if you take a long enough list of place names, you'll find parallels, especially if you're "loosy-goosy" about it. You'll find parallels with just about anything. This is easily done." "It's an unexpected place. You don't expect to see a place like that in Arabia. Arabia's a land of sand dunes. You've seen 'Lawrence of Arabia;' you know what it looks like. And those are the pretty parts. But this is an actual area on coast of the Indian Ocean, the Arabian Sea, really, and it exists in exactly the right spot. And we can show that the land of Nahom, or the area of Nahom, from which you have to travel due east, we can show that that name was there at exactly the time of Lehi. It's a complex of finds. These things fit together. They're really wonderfully strong things." There's a difference between looking for a long list of modern names in random places which may or may not correspond to vaguely-described and unknown locations, and finding a single name, especially with an appropriate date and linguistic base, in exactly the right spot relative to a well-known, clearly defined location (Jerusalem). Several difficulties present themselves for Mormanity and co. 1. The reasonable person test - would the average person on the street find half name inscriptions and trees statistically significant, NO. 2. Items such as camora islands and moroni and capt. kidd which fair better under the reasonable test, but are dismissed by Mormanity and co. 3. The three letters/tree connection is presented as one the apologist strongest evidences, when if their claims were true it would one of their weakest evidences. Contrasted with the critics (contrary to Mormanity's deceptive lie that critics claim camora/moroni is a smoking gun, bullseye, when in truth no critic seriously claims this). According to the first quote, well over a hundred years of searching from a huge abundance of potential parallels in the BoM should have resulted in many parallels by chance alone. To your dismay only one disputed and questionable parallel has been found. "This claim, like many efforts to explain away the Book of Mormon, commits the logical fallacy of the Appeal to probability. This fallacy argues that because something is even remotely possible, it must be true." Would the average person on the street find half name inscriptions and trees statistically significant? Half name? Nope. Written Hebrew has no vowels, so NHM is the full name. And trees are certainly significant in an area that was widely thought to be a barren desert. The locations are real, yes, but they have no actual, definite connection to the hill Cumorah or Moroni like NHM does (Lehi and co are never said to go to the islands). As far as Capt. Kidd, do any of his stories ever actually mention Camora/Comoros or Moroni? I have yet to see anything of the sort. if their claims were true it would one of their weakest evidences. This is just opinion (and so can't be "disproven") but it's an unfortunate one. According to the first quote, well over a hundred years of searching from a huge abundance of potential parallels in the BoM should have resulted in many parallels by chance alone. To your dismay only one disputed and questionable parallel has been found. Not a parallel, but a match - and no, not to my dismay. The critics and antis are the only ones who find it "disputed and questionable," which honestly baffles me. Straw man. This was never said or implied. Yes, we all understand how baffled you are. It's called the reasonable persontest, not the Ramer test. Even Mormanity does not necessarially find it to be a match, but only extremely interesting. Your response indicates u r ruled by blind emotion and not any rational thought process. It's called the reasonable person test, not the Ramer test. Even Mormanity does not [necessarily] find it to be a match, but only extremely interesting. Uh... I'm pretty sure Jeff considers NHM a match for Nahom. Your response indicates [you are] ruled by blind emotion and not any rational thought process. I'm sorry that's what you got out of my response, but it's simply not true. Tell me something, Mormography - why do you insult people and their religion in just about every comment thread you post on? Is it a defense mechanism? Do you honestly enjoy upsetting people? Can you not think of any other thing to say? Are you the one that's "ruled by blind emotion?" I honestly want to know here. Well w that response, every one sees what I mean, even if u r incapable. Oh, and Ramer, I am pretty sure Mormanity doesn't consider your behavior indicative of his religion. He probable finds claiming so insulting.